Eric Chavez played his last game at 3B for the #Athletics on 4/24/09 – Brandon Inge will be the 18th to play 3rd for the A's since. So the carousel at third base welcomes another player as Brandon Inge is set to play third for the A’s tonight. I for one am excited to see an established third baseman at the position. After Chavez’s departure, the A’s just have had no answers at the position. Inge provides veteran leadership and an occasional pop in the bat. He’s not going to be the player he was years ago but he’s clearly an upgrade over what the A’s have been using all season long. In part, I kind of wish that Chavez would be back with the A’s. If not anything, just for a ceremonial retirement. I was ready to see him go two years ago but now it looks like he’s doing well in New York and the A’s haven’t been able to find his replacement. But here’s to Inge and a hope for something better for the A’s. The offense needs a jolt and maybe Inge can help out somewhere in that search for a spark. Brandon Inge got tattoos of his sons' names (Tyler, Chase) while on a road trip against the A's. As some of you know, the Jacksonville Jaguars are my secondary favorite team so I do pay attention to their games and cheer them on along with the 49ers. But since I was covering the 49ers this weekend, I did not get a chance to see the above linked miraculous clip of Rich Eisen losing his mind. I don’t know if reaching for a punter that high was a good idea but having seen Andy Lee, I cannot devalue a punter. For a Jaguars offense that was ranked last in 2011, field position is so key to their offense. And with the 6th best defense, it makes sense to get a punter. After Matt Turk struggled last year, the Jaguars knew that they had to find some kind of long-term replacement for Adam Podlesh. Getting the best punter available that high shows that the team is serious about getting a potential Pro Bowler (or whatever you call them now) for the future. This isn’t a bad move really. Punters have great value to any team that’s struggling. Cheers to you Rich Eisen for loving the punters! Derrick Rose out for the playoffs, some of next year with the ACL. A shame. This reminds me of when Joshua Morgan suffered a broken leg late in a game that was decided. But this is a little bit different. It’s the playoffs and Rose has been battling injuries all year. And the fact that it’s a shortened season, keeping players rested is a must. It’s a shame that Rose got hurt and part of this is the product of a shortened season where players are forced to play back to backs all year long. I do wish that the lockout remained and that the league can go to a full season instead of this. There have been so many injuries this year and I know a part of it is due to the compacted schedule. Rose shouldn’t have been in the game to begin with. But still, this might have been avoided all together. Home of the 49ers in two years. With the construction of the new stadium, the 49ers team headquarters is also going through a change. One of the changes that affect the media is the relocation of the media trailer. 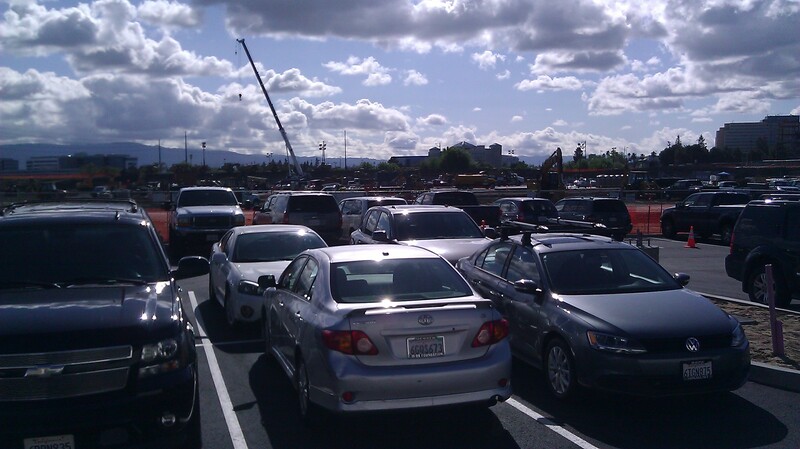 Having to find a way through the facility around construction, the media trailer was moved to about 20 yards from the original spot. But as you can see from the view, it’s pretty nice as we can look out at the new home of the 49ers. Covering the draft has always been a very interesting time. It’s when site traffic and attention is at an all time high during the NFL calendar year. Mostly all the local media outlets are stationed at team headquarters ready to talk with the new pick, head coach and general manager. This year was no different from other years. The media gathers in the trailer and just watches the NFL Network like everybody else. But our focus also goes on our computer screens and once the pick is in, we’re scrambling to get the information out and find as much scouting on the newest player. The NFL Draft is here today and for people like me, I have mixed emotions about it. There’s an excitement about new prospects joining the team. But at the same time, as a writer, it’s a very stressful time to get all the information about all the new players out there for everybody. But still, the draft is exciting. When I first started covering the 49ers, I did it for the now defunct MVN.com. I was just a junior at San Jose State but it was a real nice opportunity for me to just watch the draft at home (the first time I’ve ever done that) and see what the 49ers would do. What really sucked for me at the time was that I had a part time job on weekends so I knew that I would miss the first day of the draft. (Back then, the draft started on a Saturday). But it still was the first draft I really paid attention to and that 2007 class means a whole lot to me because I watched like a madman the following day. The new Brooklyn Nets logo? 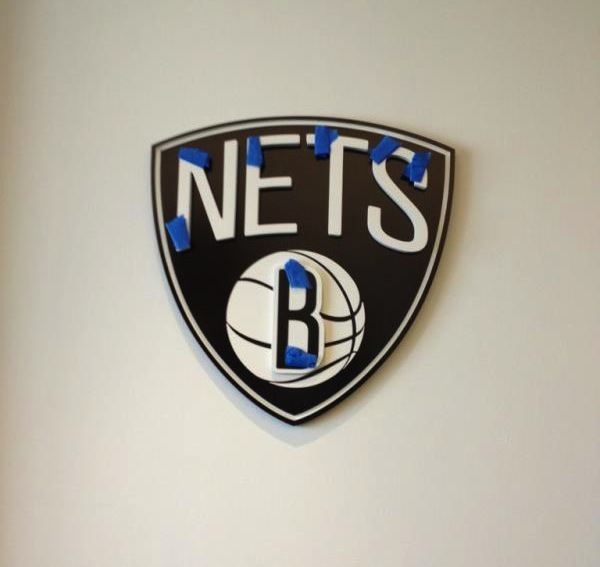 According to Deadspin, we might have our first look at the new Brooklyn Nets logo. As you can see by the photo, it has the same shield design that was teased by the team. In fact, it looks to be a very simplified version of their current logo. It’s not overly complicated as the font and the simple basketball gives a lot of homage to their New Jersey days but gives itself a new identity in itself. The Warriors have been doing this half-court shot deal this season and as you can see from the video, there have been some lucky winners. In fact, I was in attendance for the first winner (Omar) and the crowd went nuts. I wish I was a season ticket holder just for the opportunity. Not to toot my own horn, but I am very good at half-court shots. Since I was a kid, I was always a deep shooter on the basketball floor. My first three-pointer I ever made was as a first grader. Half-court shots became my norm in sixth grade. Now whenever I play ball, I practice my deep half-court shots all the time and make them. Even at Great America I make those tricky shots to win prizes. I would love to get a chance to try a half-court shot. I know I can make it too. And for $1 million, I can help out Dr. Evil’s schemes!